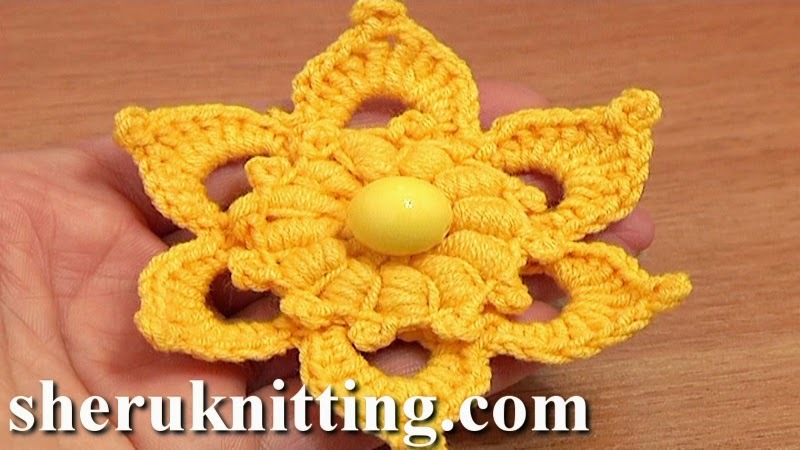 Free crochet flower patterns, huge library of crocheted and knitted flowers, detailed crochet flower video tutorials, DIY flowers for embellishing your projects, crochet flower patterns for any difficulty levels. Learn how to crochet a 6-petal flower with the puffy center made of the puff stitches with picot. Fast to crochet flower worked in 4 rounds only. Sew a bead to the center to make the flower looks even more interesting. Enjoy! Flower was made of yarn : 55% Cotton, 45% Poly Acryli, 160m/50g. Steel Crochet Hook 2.25mm (which﻿ is #2 US standard).